The department, Haryana Staff Selection Commission has been issued the official notification regarding the HSSC JE Recruitment 2019 for 49 posts. The vacant posts are for the Junior Engineer (Electrical) profiles. The department planned to conduct the examination on 29 April 2019. Many candidates have been noticed to apply for the HSSC JE Recruitment 2019. 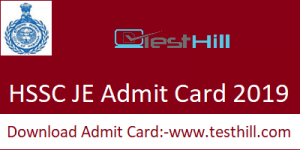 Now, the department is about to be issued the HSSC JE Admit Card 2019. The only authentic applicants have been selected and allowed to attend the examination. The desired candidates have been invited to appear in HSSC JE Recruitment 2019. Now, the department is going to organize HSSC JE Examination 2019 on 29 April 2019. Candidates who have registered themselves should be present in this written examination on 29 April 2019. For this, they have to keep their call letter with them. They will be able to download the Admit Card soon. Admit card is available on the official website i.e www.hssc.gov.in. Candidates need to provide some personal information to download their admit cards. For further updates regarding this post, stay tuned to www.testhill.com.